BERTIUS - Carte de L'Amerique Corrigee et augmentee dessus toutes les autres . . .
BERTIUS, P. / VAN LOCHOM, M. - Carte de L'Amerique Corrigee et augmentee dessus toutes les autres . . .
Carte de L'Amerique Corrigee et augmentee dessus toutes les autres . . . - BERTIUS, P. / VAN LOCHOM, M.
Title : Carte de L'Amerique Corrigee et augmentee dessus toutes les autres . . ..
Map maker : BERTIUS, P. / VAN LOCHOM, M.. 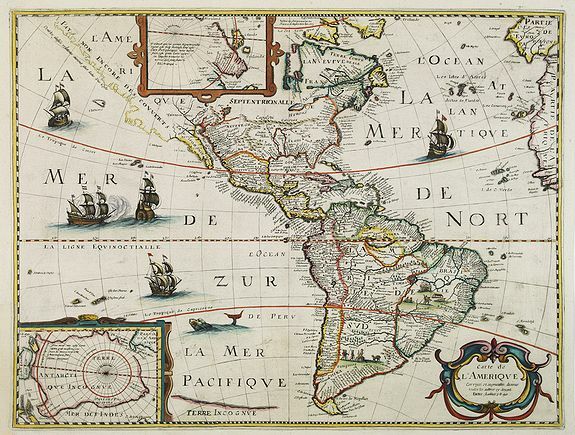 Description :Very rare map of the Americas engraved by Michel van Lochom. A second state who clearly shows signs of reworking and Burden believes that it is the same as that of 1624 listed in both Tooley and Wheat. Louis Loeb-Larocque (1989, pp.25-6) assigns this second state to Michel van Lochom, 1640, based on the fact that the other three continents all bear that date and two of them the name. The map is based on the Jodocus Hondius of America, 1618, but bears major alterations along the entire west coast of North America. With a dotted coastline with the legend PAYS NON ENCORE DECOVERTS (land not yet discovered). According to Burden this reflects possibly an attempt to balance the two schools of thought at the time as to whether California was an island or not. Michel van Lochom (1601-47) was a engraver and royal printer, active at Rue St.Jacques & à la Rose Blanche Couronné, Paris. Condition : In lower center part a piece of paper 3x3cm. missing and replaced and care fully redrawn. In very good condition.